And thou shalt rejoice in thy feast, thou, and thy son, and thy daughter, and thy manservant, and thy maidservant, and the Levite, the stranger, and the fatherless, and the widow, that are within thy gates. . - The Bible – Deuteronomy 16.13-16. A stab of fear pierced Galadriel’s heart. Long had she foreseen this day, yet still she hoped her foresight would prove false. If she bade the intruder leave her borders maybe the danger would depart with him? But no, whatever threatened Arwen had already come to pass. Her beloved granddaughter had grown sadder and quieter these past years; while her laughter was seldom heard. Arwen had spoken of the love professed by one of her father's mortal fosterlings and the stars had shone again, if only briefly, in Undómiel’s eyes, when she spoke of the young Man. Arwen had claimed she did not return his affections, yet there was a gentleness, a wistfulness in her voice when she spoke of Aragorn son of Arathorn that belied her certainty. And now, it seemed that the very Dunadan had walked out of Arwen's dreams into Galadriel's own realm. She would, Galadriel decided, at least speak with the Man. Arwen had gone riding with Celeborn, she did not need to know; at least not yet. “Bring him to me, Haldir,” she commanded and sat back in her chair, staring at the silver and green walls of the chamber without seeing them. Within the hour Haldir returned with the traveller. When Galadriel beheld him she could have laughed. His clothes were torn and filthy. Galadriel struggled not to wrinkle her nose with distaste. The intruder smelled strongly of dried mud, horses, and Orcs! He walked with a limp and his face was disfigured with bruises.This stranger take Arwen away from her? Absurd! Galadriel said nothing but simply looked into his eyes. Unlike many: Elves as well as Men, he did not flinch from her gaze. The discomfort he must have felt was well concealed. For a moment the traveller appeared to be trying to veil his thoughts as if from long custom. He then collected himself, remembering he was amongst the Eldar. Galadriel’s mind freely probed his. She sensed above all, a noble heart, greater than any of the Secondborn for many a long generation, but one shadowed with weariness, sorrow and pain. His eyes held her attention most of all, large and grey they spoke of courage, compassion and a noble heart. 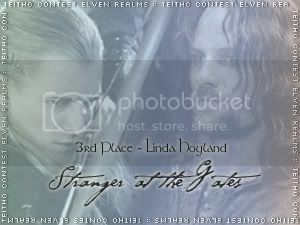 Although clearly a mortal man, there was something Elvish about him, but of course, the line that Elrond fostered were his brother’s kin, like him descended from Lúthien the Fair. “You may bide here a while,” she said. Uneasy as she might feel, the laws of hospitality demanded that she grant him food and shelter. “I thank you, my lady,” said Aragorn. He promptly collapsed in a dead faint. As soon as the stranger had been taken away, Galadriel bade her handmaids sprinkle sweet blossoms around the chamber to freshen the air. She then walked alone to her garden and poured water into the silver bowl that was her mirror. At first the clear spring water looked as clouded as that from a muddy pond. She forced herself to calm her racing thoughts. She must know if this man was indeed the one whose coming she had foreseen. His appearance was that of a vagabond, while his heart was that of a hero. Was Arwen doomed to bind herself to this man and fade and die a mortal like Lúthien before her, forever lost to her people? Surely that could not be? Not her only granddaughter, the fair Evenstar. Galadriel smiled wryly thinking how disappointed she had been when the babe had been born with the dark hair of the Noldor, rather than silver locks of her mother or golden tresses of her grandmother. She had grown, though, to be so fair, that many wondered were she Lúthien reborn. Not only was Arwen fair, but also loving and wise. Galadriel looked again in the mirror. This time she saw a battle raging and the stranger was leading the men to victory and being offered the Crown of Gondor by a man as like unto him as close kindred.. Then came another vision of Middle-earth, desolate under the Dark Lord’s power. Vision after vision followed of Arwen alone, desolate as frost in winter, or with the man at her side and fair children, her eyes full of laughter. It seemed that not only Arwen’s fate was tied to this man, but all of Middle-earth’s. Heavy of heart, Galadriel wandered amongst the mallorns: she had always known that one day the Dark Lord’s increasing power might force her to leave her cherished realm, but had expected to travel with all her family to the Undying Lands where Celebrian awaited them. Now she feared that was not to be, but if she tried to protect her granddaughter from her destiny, a dark fate would befall the world of Men, while Arwen would never find happiness until the breaking of the world. Galadriel loved her granddaughter; there was only course she could now take. Aragorn, son of Arathorn lay pale and still upon a low bed. 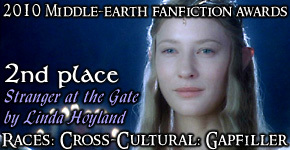 “How is our guest?” Galadriel asked the attendant healer. “Is he injured?” asked the Lady. Galadriel pulled back the blankets a few inches. The Man had the same lean, muscular build as an Elf, though at present he lacked sufficient flesh. The scars of old wounds disfigured his body, but nothing appeared to ail him that Elvish-healing arts could not swiftly remedy. Covering him again, she gently took his hand, a scratched and calloused hand, but at the same time both strong and slender. A week later Galadriel again went to visit her guest. This time, he was sitting up in a chair dressed in a loose robe. His hair had been trimmed and his beard shaved, making him look more like an Elf than ever. “Your own clothing is being washed and mended,” said Galadriel, unwrapping a parcel that she had carried tucked beneath her arm.” I have brought fitting raiment for you.” It contained fine linens together with a silver and white tunic and breeches. She then drew forth a bright gem from the folds of her gown. “Seven days in your reckoning,” said Galadriel. “Come walk with me beneath the trees before we dine,” Galadriel said to her granddaughter early that evening. The two women strode arm in arm admiring the Mallorns. It was a perfect spring evening. The air smelt sweet with the many flowers. A thrush sang melodiously in the trees, while the setting sun made the blossoms gleam like burnished gold. Suddenly a man appeared from the opposite direction, like unto an Elf Lord from the Blessed Realm itself. Arwen stopped suddenly and gazed at the approaching figure as if transfixed. He likewise did the same. Galadriel turned and walked away. For good or ill, Arwen’s doom was decided.